Bunny And Basket Toothpick Holder, Bargain Shack offers Boyd Glass, Mosser Glass, L.G. Wright, and Contemporary Collectible Glass including Vaseline Glass - J.B. Scottie Dogs, Pooche, Animal Covered Nests, Toothpick Holders, Salts, Glass Animal Figurines, Clowns, Dolls, Slippers, Vehicles, and More! This L.G. Wright Bunny has a big job ahead of him when it comes to that basket! The wonderfully detailed bunny carries a woven basket upon his back. 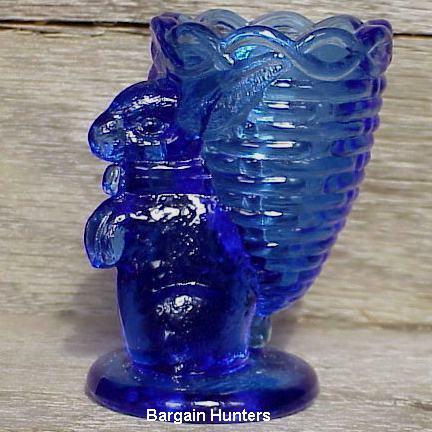 It stands 3-1/4" tall done in wonderful cobalt blue. Let it hop into your collection today!